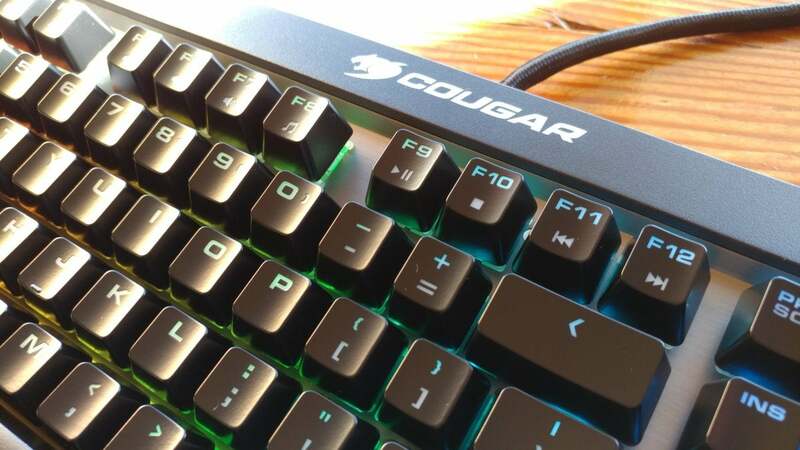 Cougar Attack X3 RGB (2018) review: An RGB keyboard for under $100? Believe it. RGB backlighting and Cherry MX switches make this a flagship keyboard at an entry-level price. 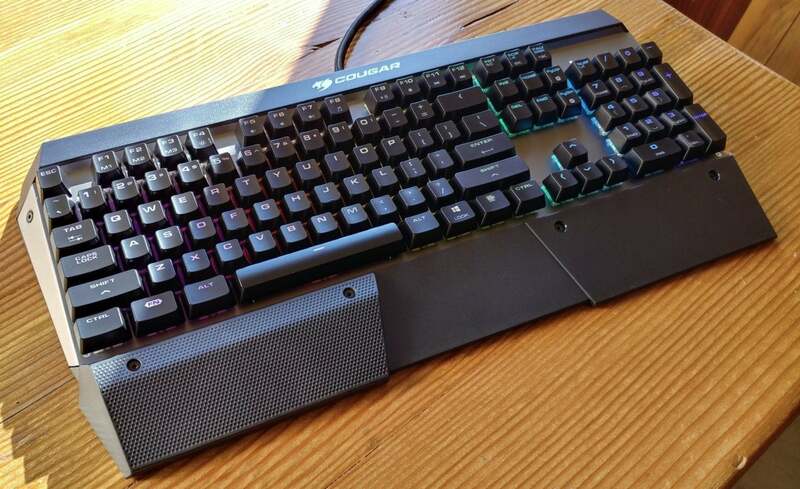 Last time I looked at the Cougar Attack X3, I called it “an unpretentious keyboard.” Not exactly the most inspiring compliment, but about the best I could do at the time. The standout feature was that it contained honest-to-goodness Cherry MX switches in an era where that’s increasingly rare. Still, the Attack X3 was far from the only keyboard to feature Cherry switches in 2016, and in all other respects—shape, materials, lighting—it was just competent. Inoffensive. Boring, perhaps. But dropping the price can make an also-ran into a must-have item. 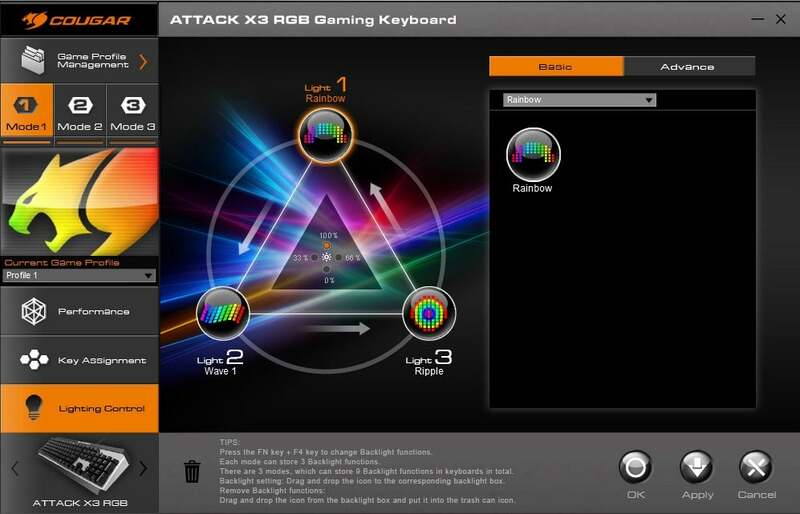 Such is the case with the Attack X3 RGB’s 2018 revision, a full RGB-backlit keyboard that’s selling for under $100. Note: This review is part of our best gaming keyboards roundup. Go there for details about competing products and how we tested them. Okay, the list price is technically $109.99, but a) That’s a bit less interesting and b) I haven’t seen anyone selling it for the list price anyway. Both Amazon and Newegg have the 2018 Attack X3 RGB listed for $99 and change. That’s wild. Around five years ago, when RGB backlighting first started spreading, you’d be hard-pressed to find an RGB keyboard for under $180. Then G.Skill’s Ripjaws KM780 became our official RGB keyboard recommendation because it sold for around $140. But $99? With full per-key lighting customization? Literally unheard of until now. Not to mention the Attack X3 RGB also features Cherry MX switches, which are typically more expensive to procure than the Cherry knock-offs other companies employ. How is it possible? I’m not really sure. You’d expect build quality to be compromised, and indeed there are some trade-offs. For instance, the previous Attack X3 featured standalone volume controls in the top-right corner. Those have been removed, with all media keys now set as secondaries on the Function keys. That’s not my favorite setup. But the compromises are minimal, given the price. The 2018 Attack X3 RGB carries over a lot—maybe even too much—from its predecessor. It wasn’t the best-looking keyboard before, and its aesthetics have barely changed. The 2018 model has the same angled chassis, with the same sloping sides, and the same Function key where a standard Windows key typically lives (which continues to annoy me). 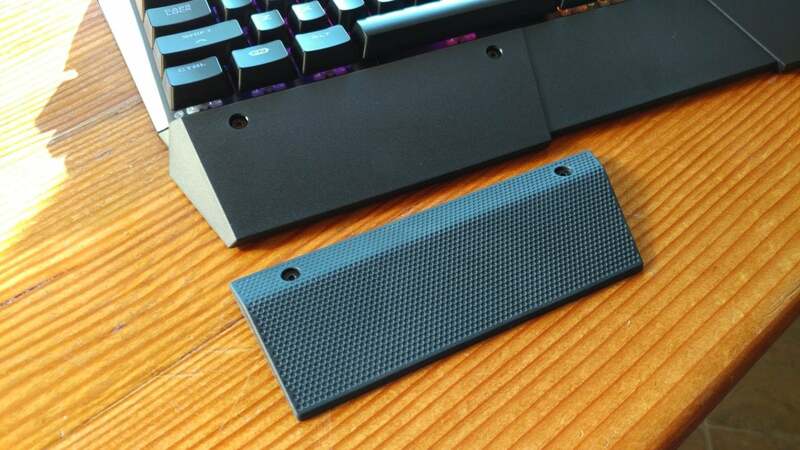 It also retains the dual-toned melding of black plastic with a brushed-metal backplate. Cougar even kept the same blocky typeface on every key. Still, unpretentious as it might be, it appears Cougar hasn’t sacrificed the core build quality. In fact, there’s been one major addition to the 2018 model—a wrist rest. Nothing fancy, just a slab of plastic about two inches in depth. The one gimmick is an additional layer of rubber-clad plastic you can add to the left side, which I guess is why Cougar calls it an “FPS Wrist Rest” and not just “A Boring Ol’ Wrist Rest.” In any case, it’s a welcome addition, though really I wish the whole wrist rest were that same height and the same rubber texture. I have no idea why the price is so low though. The Attack X3 RGB seems like a perfectly fine keyboard. The feet are solid, the weight is good, the fabric-sheathed cable is suitably high-end, and as I said, it uses official Cherry MX switches. The model we received for review shipped with good-ol’ Cherry MX Blues, my longtime favorite, and an increasingly rare sight in the gaming world. So yeah, there’s nothing I can point to and say, “Ah, this is where they cut corners.” Just a top-tier keyboard for a cheaper-than-cheap price. Indeed, Cougar fixed my biggest problem with the 2016 model. I hated—hated—the lighting. One aspect in particular, really. In the previous Attack X3, where separate media keys lived in the top-right corner, Cougar was forced to move the Caps Lock, Scroll Lock, and Num Lock indicator lights onto the keys themselves. And since Cherry’s RGB switches have offset LEDs, as opposed to sitting right beneath the center of the key, Cougar opted to illuminate the indicator as opposed to the key text. As a result those three keys among all the others would remain unlit, save for the times the indicator light was active. As I wrote at the time, it looked like a mistake. Much as I mourn the loss of the volume keys on the 2018 model, it does leave room for indicators in the top-right corner, meaning those three keys are now properly backlit. A small improvement, maybe, but it changes the whole appearance. And the lighting itself is beautiful. In 2017 I said that Corsair’s K95 RGB Platinum was the prettiest keyboard I’d seen yet. The 2018 Attack X3 RGB lacks the light-ribbon across the top edge, but Cougar uses the same Cherry RGB switches and thus the lighting is otherwise indistinguishable from Corsair’s keyboard—which, I might add, costs twice as much. Now the only issue is Cougar’s actual software. It’s menus on top of menus on top of menus, with a 1990s-looking color scheme and wonky typeface to boot. To change the lighting you have to drag those circles from the right side onto one of the slots on that triangle thing, then hit Apply in the bottom right. Making matters worse, it takes upwards of 5-10 seconds for the new lighting scheme to save to the keyboard, during which time the keyboard is basically unusable. Oh, and there’s also no Static option, for those who just want to pick a color and leave it. The keyboard is always pulsing away, or cycling through the rainbow, or whatever you end up choosing. Not a great experience. As I said, software is a weak point for all peripherals, but Cougar’s got a long way to go to catch up with the competition. Software’s a pretty small caveat though. This is basically a flagship keyboard with an entry-level sticker price. 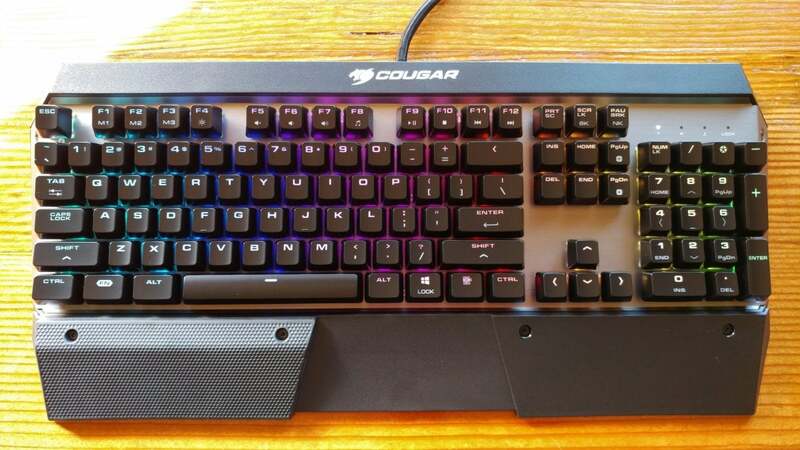 Full per-key RGB lighting, Cherry MX switches, decent build quality, wrist rest—Cougar’s pulled out all the stops here, and then charged half as much as the competition. And that’s hook enough for me. As I said earlier, the previous Attack X3 was sort of an also-ran—functional, sure, but nothing about it really stood out. Cougar hasn’t changed much for 2018, but the price sure is right this time around. 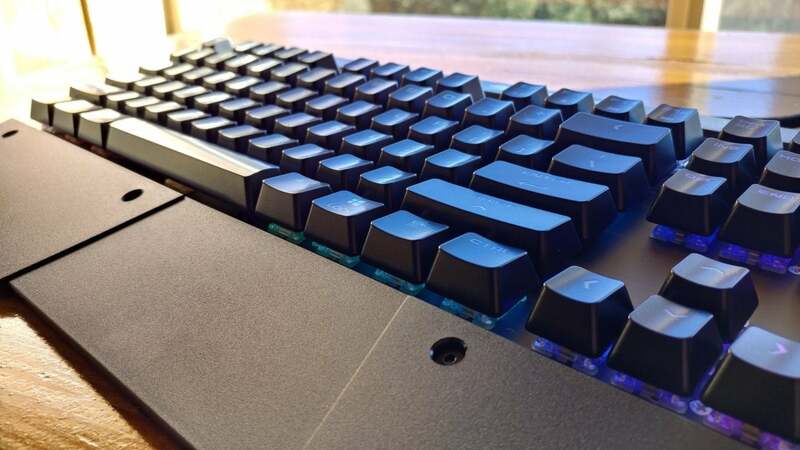 Those looking to upgrade to an RGB keyboard would be foolish to overlook this one—as long as you can deal with not having a left-hand Windows key. That’s a sacrifice, I know, but one that’s probably worth $100. Coming in under $100 with full RGB backlighting and Cherry MX switches, the Cougar Attack X3 is essentially a flagship keyboard at an entry-level price.